So, you want to start a new online business in Nigeria but you’re not sure what the best idea is? Most people want to start a new business online but they struggle with coming up with brilliant ideas. The truth is that there’s no new idea anywhere in the world, you just have to look at what is currently trending and find out a way to position yourself and start a business. Ok, I’m going to prove to you that there’s no new idea anywhere in the world, and you can even start a new online business this weekend. Ok, lets start with Facebook. Facebook is one BIG success case study today. Every single month, over 2 Billion people visit Facebook. 2 Billion visitors per month. Imagine having a business where only 1% of that number come into. 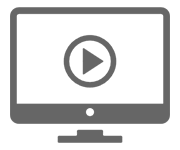 NOTE: Click Here To See How We Can Help You Turn Your Stories, Advice, Knowledge, Passion and Talent Into A Highly Profitable Online Business. LEARN MORE! Mark Zukerburg didn’t come from heaven with that Idea, he simply refined what was already working. I’m not sure if you’re aware but those days, the BIG thing was ‘myspace’. It was the big social media platform then before Facebook ‘demolished’ them. Facebook tried to buy snapchat but the deal didn’t go through, so what did they do? They copied Snapchat by releasing a new product called ‘Instastories’. Instastories is available on Instagram, which is owned by facebook. 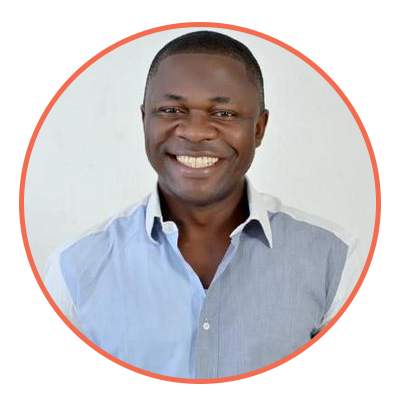 My goal today is to show you, step by step, how you can start a new profitable online business in Nigeria this weekend from the next blog post you’re going to read. I'm sure you know what blog posts are, this one is one. I know you know what blog posts are, so lets not waste time on that. If you go to Google right now, you’ll see that over 2 millions of blog posts are produced every single day. Why do you think people read blog post? People read it because they’re seeking for advice, they need help, they want information and knowledge. 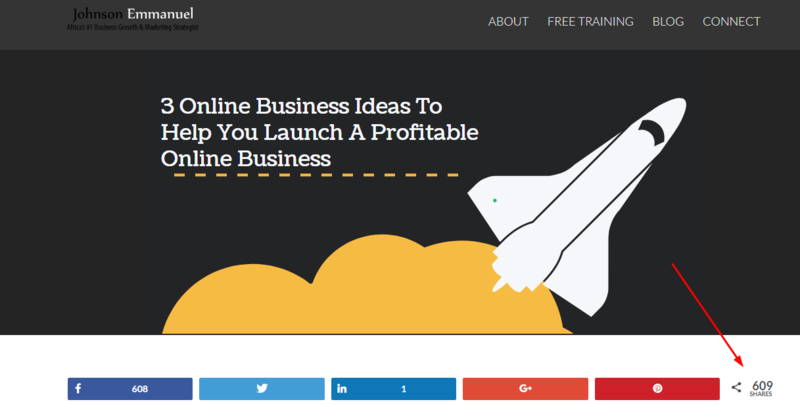 For example, you’re currently reading this blog post because you need information about ‘how to start a profitable online business by reading a blog post’. 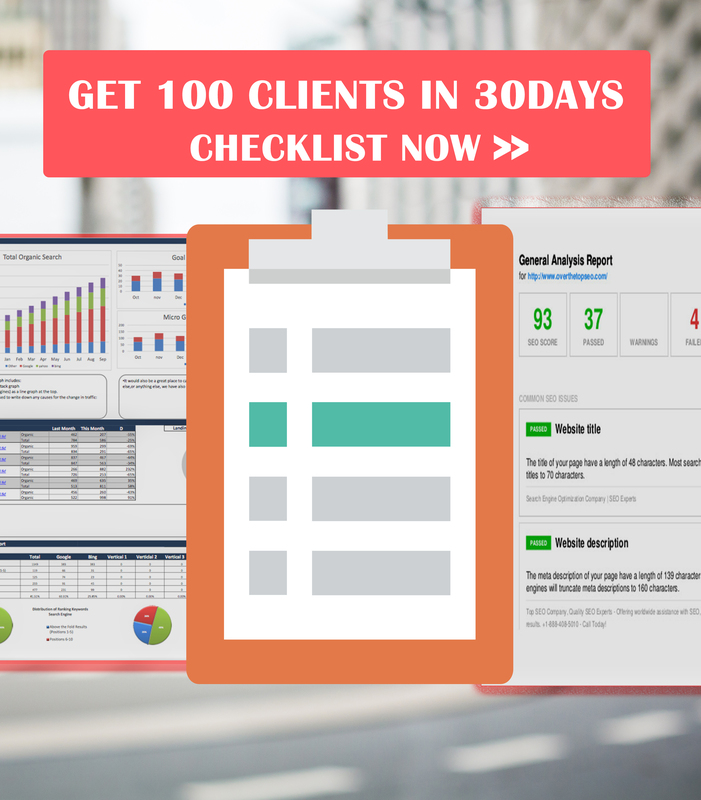 Several thousands of people are also going to be reading this blog post as well but it is only a few people that will actually put in the work, it is only a few that will actually execute. It’s sad but it’s the unfortunate truth. Why will anyone spend time to read a great blog post on the internet and after reading the person just goes away to do the next thing. You see, as human being, we’re naturally lazy and we procrastinate alot. Almost a quarter of adults around the world are chronic procrastinators, according to a research conducted by Joseph Ferrari, professor of psychology at DePaul University. Do you know that if you read a blog post and liked it, chances are that many other people also like it? Take a look at this blog post I wrote here, you will see that over 600 people liked it and they shared it. The downside is that so many people will just read and wait for when the next blog post will go live. They always ‘hear’ but never ‘do’. Just go to Google right now and type ‘How To Start A Profitable Online Business In Nigeria’ and you’re going to get a lot of responses from google. ​You will see that over 7 Million result was returned by Google, meaning that millions of people are interested in the topic. 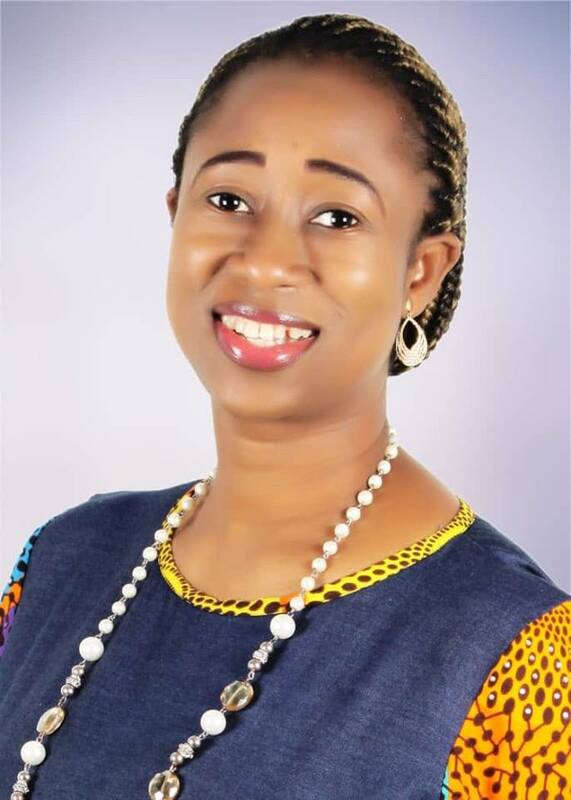 My goal today is to show you How To Start A Profitable Online Business In Nigeria or anywhere else in the world from the next blog post you are going to read and I urge you not to procrastinate. 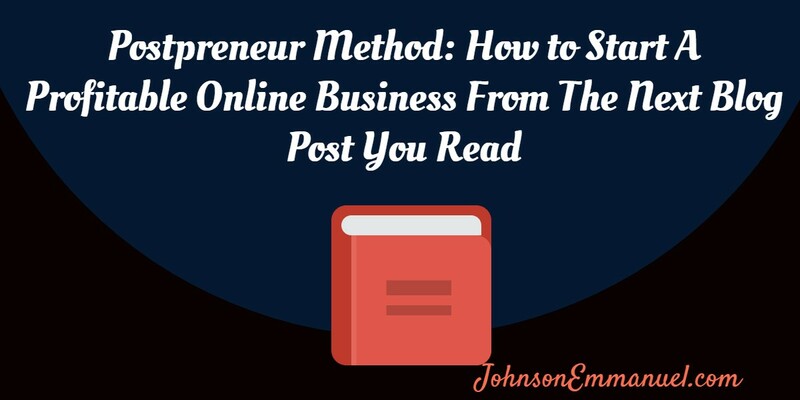 It is a what i call 'postpreneur method', turning blog post into a profitable business. If you don’t have a business yet, this is going to work for you. If you already have a business but want additional stream of income, it’s going to work for you. If you’re employed somewhere already but plan to sack your boss someday, this is going to work for you. Point is, no matter what stage you’re, this is going to be very, very helpful to you. Ready to fly with me? Step 1: Identify The Best Blog Post people read. I’m not sure what your interest is but if you’re like me, I love anything business, entrepreneurship, marketing and dating. These are the aspects I’m very big on and I consume any material around those topics. So, lets get down to the practical. 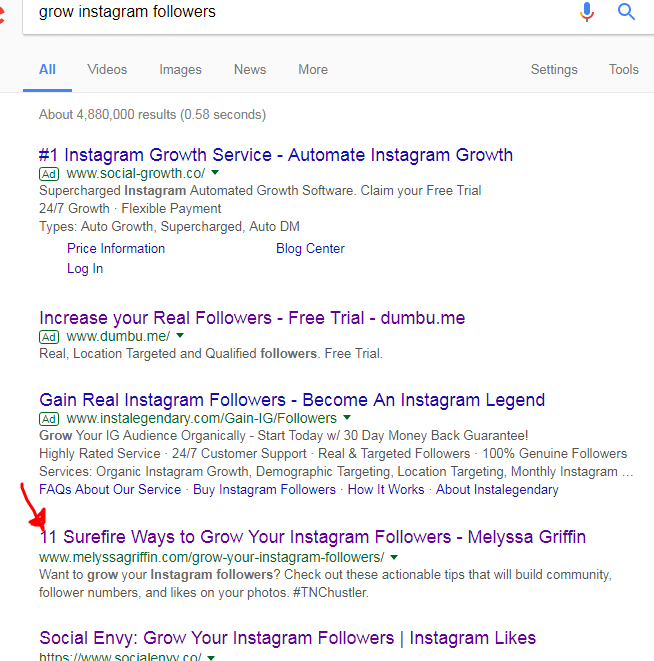 Lets say I am online and I type ‘grow instagram followers’ into google to find a blog post that I might read. As you will expect, there are many blog posts that will pop-up and you also will see many advert. You want to avoid any post that shows ‘Ad’ before it because it is an advert by Google. If you look at the image above, you will see that is a blog post, so we click on that blog post. Now, you don’t just want to read a blog post, you also want to be sure that enough people actually shared the blog post for many reasons. Step 2: Discover People who likes or shared the post. You’ve seen that people shared the post and they did because they like it. 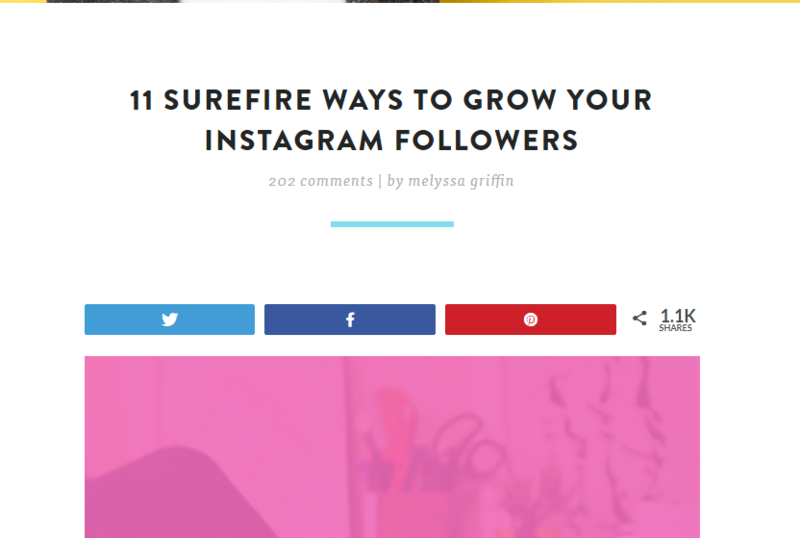 Most people who read the blog post did so because they want to grow their Instagram audience and they will be very, very happy if they can get someone to help them grow their Instagram audience. Your job now is to reach out to people who shared that post and tell them that you also read that post and can help them implement the strategies to grow their instagram audience. Pheeww! A New business is born. If you think it is a small business, you better rethink because so many people want to grow their instagram account. 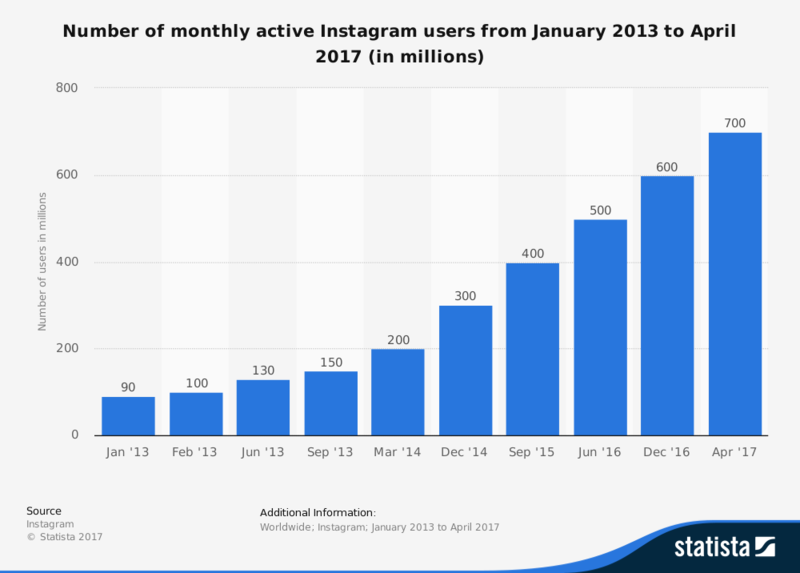 According to static, over 800 million people visit Instagram every month and it is growing like wildfire. I’m not saying you should or must start your business in that area. It may not be what you’re passionate about, and I’m a big believer that you should do what you are passionate about. So, no matter what your area is, this same method will work for you but make sure that atleast 500 people like or share the post. These 500 people are your potential customers. I know what you’re thinking, 'how will I know the people who like or share the post since I said you should contact them?'. I will show you how to reach out to those people. Buzzsumo is a tool that will help you find the people who shared the blog post so that you can contact them and tell them about what you can do for them. So, go to buzzsumo.com and type in the URL (aka link) of the blog post that you just read. As you can see, Buzzsumo has shown us the people who shared it on Facebook, Twitter and Google plus. Now we are going to click on the ‘view share’ button to see the people. That is the button you need to click. Mind you, you’ll need to create an account on buzzsumo, there’s a free trial. Immediately I clicked, I brought out some people who shared the post, check out this image below. Make sure you exclude the author of the post and reach to other people who shared the post. You can reach out to them either on Twitter, Facebook or by email. Now, you can see that you have their website address, twitter handle, etc. You don’t have a business until you have customers, right? ‘Hey (NAME), I was just browsing the internet and I saw this post on WW.XYZ.COM It’s a great stuff. I’m sure that you love it as much as I do because you shared it. Honestly, I also feel for the temptation and had to share the post like you did. I was so inspired by that blog post that I launch a new business from that post. So, I can actually help you implement all the steps taught. Is this a thing you would like me to do for it? Can you see how to ‘soft pitch’ people with looking like a jerk? Many people won’t reply you, only a few will. So, let’s say you email 100 people and you get only 10 people to take you up on your offer, that is a great deal. If you charge $200, you’ll be making $2000. It’s a thing you can even start this weekend. Now need to waste time, no need to look for money for advertising, everything is 100% FREE. I do know that 10% is a very conservative figure but I had to use it to be more realistic but you can even get way more than 10%. I need you to know that you shouldn’t be greedy at this stage, your goal is to start a business right now, not tomorrow. So, if that is your goal, you want to charge small and scale from there. Make sure you deliver exceptional service to people and once you do that very well, everything else will naturally work in your favour. If you recall, I started by saying nearly a quarter of adult don’t finish anything they start. They start a thing and when they get to a point or hit a roadblock, they stop. Now, I have show you everything you need to launch a new business, all you have to do now is to take action. Don’t join all those people who will never get tired Googling ‘How To Start A Profitable Online Business In Nigeria’, it is time to go get your first blog post and start a business. I’m curiosu, what comment or question would you want me to answer about this new method I just showed you? Drop it in the comment box, I will respond to every single question and do my best to help you launch a business.